Situated in the trendy Eixample district, just a 10 minute walk from the famous Plaça Espanya and right next to Joan Miró Park, this modern apartment is the ideal choice for friends, couples or families. Eixample offers the perfect balance of history, architecture and art whilst also being home to some of the best shopping in the city! This apartment is stylishly decorated and accommodates up to 5 people. There is a modern yet homely feel throughout, ensuring comfort during your stay in Barcelona. There is a total of 3 bedrooms and 2 bathrooms. Five single beds are distributed through the bedrooms and both bathrooms have a walk-in shower. The apartment also boasts a balcony, offering guests the perfect space to take in the Mediterranean air. The chic living and dining area is the perfect place to relax in the evenings and has a comfortable sofa and armchair, a flat screen TV and a dining table. 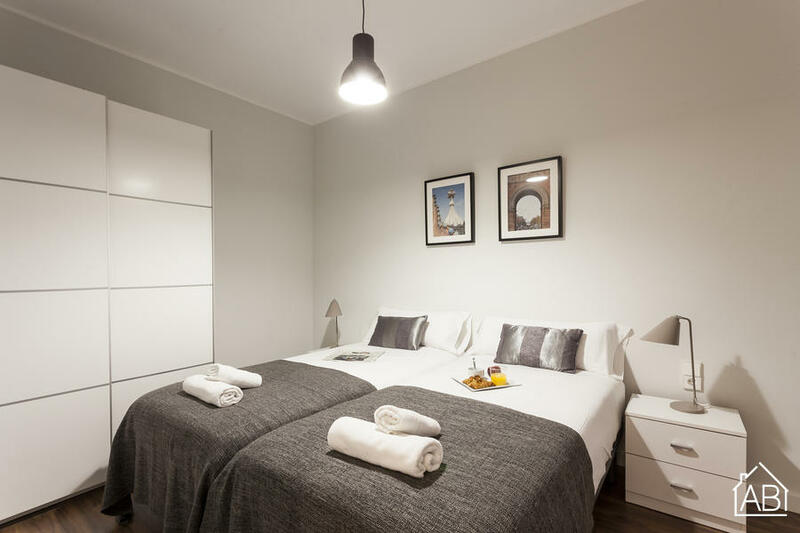 The kitchen is fully equipped with pots and pans, an oven, microwave, kettle and a toaster, as well as a coffee machine, juicer and blender, allowing you to enjoy your very own home-cooked meals whilst in the heart of Barcelona. Further amenities that come complimentary with the apartment include air conditioning and wi-fi, an iron and ironing board, a hairdryer, towels and a washing machine. This apartment is family friendly, allows pets and is the perfect choice for both long and short stays in Barcelona.